These rugged unbreakable outdoor mirrors feature a red frame, making them ideal for a wide range of applications where they need to stand out from the background to make them highly visible. 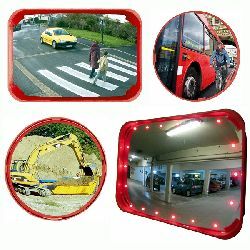 Available in a range of sizes and formats (round or rectangular), these high quality mirrors are very popular at Civil Works sites and are also favourites for use as budget traffic mirrors, as well as having many other applications. Each mirror is supplied with a heavy duty fixing kit allowing easy attachment to a post or wall (or other flat surface). - We also offer these mirrors with alternative frame colours: Green Framed ECO Mirrors and White Framed Multi Purpose Mirrors. Pay a visit to our Mirror Information Page for more essential mirror information and help.